A terrible shipping disaster, entailing the loss of eleven lives and a screw-steamer, the Holmrook of Newcastle, took place on Saturday night, at Holy Island. The Holmrook left Arbroath on Saturday forenoon, and shortly after encountered severe weather. There was a blinding snowstorm, in which it would been the vessel entirely lost her way, for she was much out of her proper course when she struck on the rocks at Holy Island. It is also singular that neither the Longstone nor the inner Farne light should have been noticed. The vessel struck with considerable force, and began to fill. The crew, however, remained by the steamer for a good while in the hope that the blowing of the whistle would attract attention. Despairing of help, and not knowing where they launched the lifeboat, and all of the crew, twelve in number, got into it. They then pulled out to sea, but the boat capsized, and all were thrown into the water. Four of the crew managed to clamber on the bottom of the craft, which righted again. Johann Rudolph de Vries, a Dutchman, who was the only survivor, managed to cling to the craft, and got under the Thwarts, where he sheltered himself until the boat was cast ashore by the tide. Being in ignorance of the locality, and more dead than alive, he determind to remain under the boat till the morning, and at daybreakhe made the best of his way to a farmhouse in a pitiable condition. The inmates, names Renton, treated him with every kindness, and afterwards he was removed to the Northumberland Arms (Mr. Wilson's). The Holmrook is holed, and cargo washing out; decks submerged. The vessel is in an exposed position, and will soon break up. It is considered she will be a total loss. 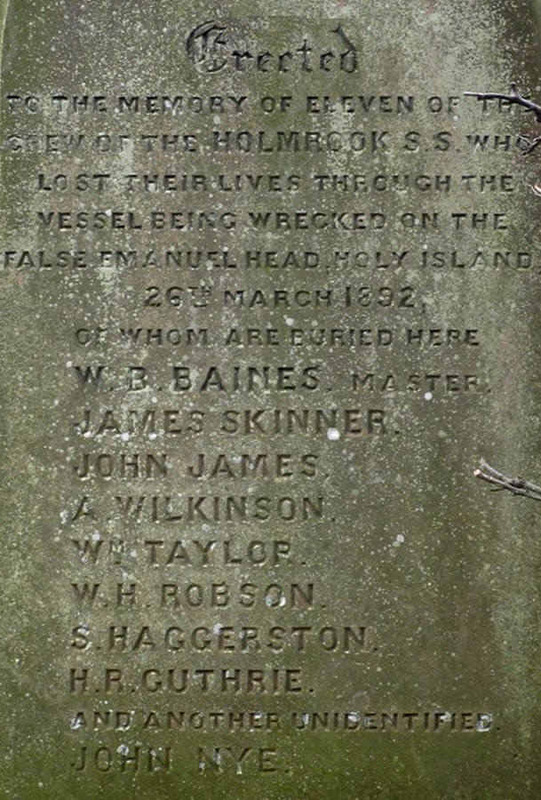 William Brown Baines, captain; John Nye, mate; William Taylor, second mate; Charles Johnson, steward; John James, John de Vries, Abraham Wilkinson, and James Yorston, able-bodied seamen. William Henry Robson, engineer; Samuel Haggerston, second engineer; Joseph Brown, fireman; and John Wheatley, fireman. Of the wreck of the Holmrook, a valued correspondent at Holy Island writes: - "Hugging the shore too closely after passing St. Abbs and Berwick, she struck on what is called the False Emanuel Head. After the ship had rolled and drifted farther and farther on to the rocks, the captain gave orders for every man to take a life belt, and then for all to get into the long boat. They did this, but never sent up a rocket or burnt a light to show any on shore a signal of distress. This was a fatal mistake. The long boat was capsized twice, and the poor fellows stuck to her as long as they could, but at last, one by one , they were overcome by the fearful cold and exposure, and wounded, bleeding, stripped, their bodies one by one came ashore. At ten o'clock on Sunday morning I was called upon to wend my way with the only man who was saved to a shed where four bodies (one entirely stripped, all more or less bruised and wounded, faces lacersted, brows broken in, & c.) were laid in order. The poor fellow who accompanied me - the only one saved out of the twelve, John Rudolph De Vries - as he recognised each shipmate, took him by the hand and with checks drenched in tears he would say, "Good-bye, Jack," "Good-bye, Will," and such like expressions. The poor barn in which the bodies are laid was filled with fishermen - big, strong, powerful men, who at a moment's call are always ready to do their level best for any distressed crew - in this case, when they saw the emotion of the one survivor, as he seized the cold and lifeless hands of his comrades, one by one, the tears falling down his cheeks the meanwhile, they were moved to a man, and seemed to share in the one feeling of pity that no light had been shown; for the chances are that had a light been put up the whole of the crew might have been saved. It was a scene never to be forgotten to see an old barn temporarily fitted out as a motuary - with four lifeless bodies side by side - to take the only survivor in to name them. "Second mate," "second engineer," "two firemen." To hear that poor fellow's sobs as he seized the cold, damp hands of his drowned comrades would have moved the heart of anyone. "Jack, Jack, I'll give my life for thee; will ye no speak, man. Oh, Jack! Jack!" Such were the words to which I had to listen. The poor fellow sobbed like a child, and who will say it was not manly so to do. There are times when even a man may weep. I would that your people of the countryside might know and realise something more of our sea coast life. I am afraid at present it is to them almost as a blank or a dream." On Tuesday Mr. C. Percy, Coroner for North Northumberland, held an inquest in the Northumberland Arms, Holy Island, on the five bodies washed ashore from the S. S. Holmrook, which was wrecked off False Emmanuel Head on Saturday night during a snowstorm, when eleven men were drowned. The bodies washed ashore were those of William Henry Robsen, chief engineer, belonging to Newcastle; William Taylor, second mate, Sunderland; Samuel Haggerston, second engineer, Sunderland; and Henry Robert Guthrie and James Skinner, firemen, belonging to West Hartlepool. The bodies were identified by John Rudolph de Vries, the sole survivor of the wreck. Evidence having been given as to the recovery of eleven bodies. The Coroner summed up, and deplored that there was no mortuary for the reception of bodies. The Vicar (Rev. 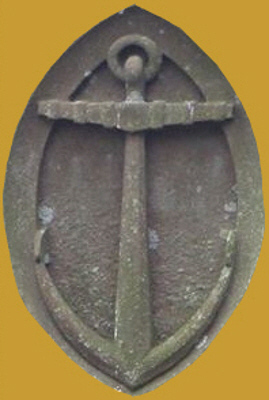 W. W. F. Keeling) and Mr. Morley Crossman represented the necessity of having a moruary inthe island, and the Coroner promised to send the representation to the lord of the manor. On a suggestion of Mr. Morley Crossman, the Coroner undertook to represent to the Board of Trade the necessity of having a lighthouse at Emmanuel Head. The jury returned a verdict that the deceased men were accidentally drowned. 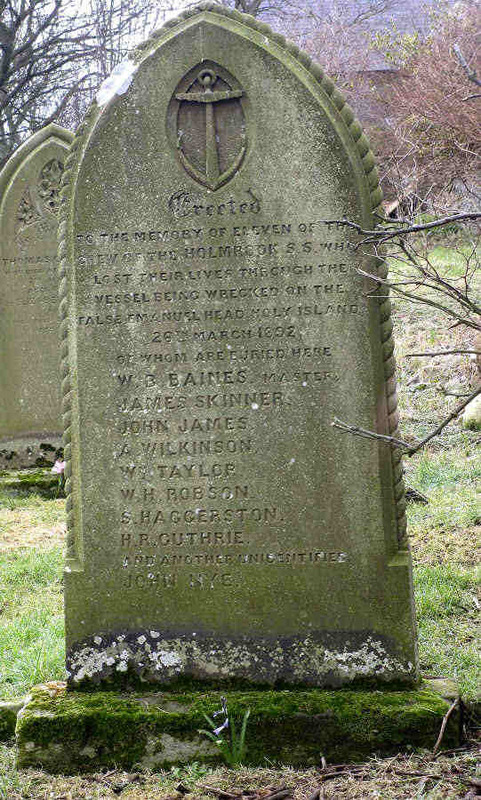 Baines, William Brown, of 25 Northcote Street, Newcastle-upon-Tyne, master mariner, died 26 March 1892 at Holy Island. Probate Newcastle-upon-Tyne, 20 May, to Hannah Maria Baines, widow. Effects £ 200.